Improve the day-to-day operations of your business with a centralised, cloud-based job management system. TimeTrak provides your business with a number of features that assist with the management of jobs and tasks to improve the productivity of your team. With our job management software, you can schedule work days, weeks or months in advance to ensure you never forget a task. TimeTrak gives everyone in your company an overview of their work calendar (day and week views) and allows for better control over resource allocation. 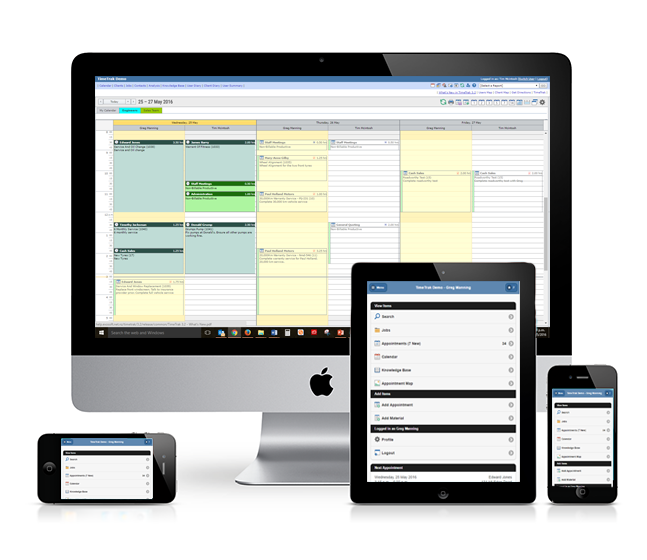 TimeTrak offers a complete, portable job management solution that can be accessed from any mobile device. Field technicians can view tasks by order of priority, last created or scheduled by date making them easy to find. Begin and end each job with TimeTrak. Using templates you've set up from past jobs makes quoting a breeze, send the quote direct from TimeTrak to the client, once accepted, set up time in your technicians calendar, then over to them. In TimeTrak Mobile, field staff record their travel time, time spent on the job, materials used, health and safety checklists, then send an invoice for the work done direct to the client while still on site, if necessary. You'll have full control of your projects with total visibility of how projects are tracking and which areas are more profitable than others. Contact us for more information or to book a demo.